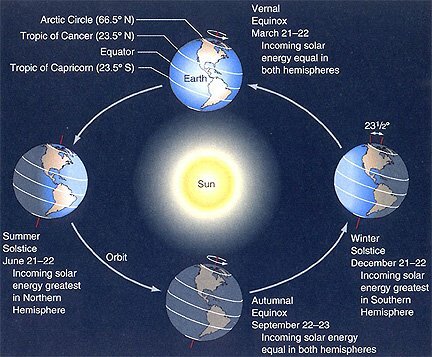 Today is the March Equinox. You’ve probably already heard it a few times today; people running around proclaiming with utmost exuberance how today is the first day of Spring. After the long winters that some of us endure, the arrival of Spring is welcome news. But what is really going on today? After all, where I live it still feels like the middle of Winter, but flowers were already blooming on a trip I took to California a couple of weeks ago1. If we based “The First Day of Spring” on climate patterns, regions across the globe would be recognizing a wide variety of days throughout the year. When someone says today is the first day of Spring, what they really mean (whether they know it or not) is that today represents an equinox; specifically, the March Equinox.2 On Earth, an equinox is the point in its orbit around the Sun when both hemispheres are equally illuminated; our tilted Earth lines up to a point in which the Sun passes directly over the equator. This happens twice a year, on the March and September equinoctes (which I learned today is the proper plural form of the word equinox). Contrary to popular belief, the day of the equinox does not represent the day where daylight and darkness are equal. You can thank geometry, the atmosphere, and the Sun’s angular diameter to cause that equality to happen at different times geographically. What today does mean though, is that the equinoctes are the only two days in which the Sun rises due-East and sets due-West, and which the Sun would pass directly overhead from an observer on the equator. One other very important thing that you must know if you don’t learn anything else today. Way too many people believe that the equinoctes are the only day of the year that an egg can be balanced on its end. While its true that on the equinox an egg can be balanced, it’s also true of every other day of the year; it makes no difference! There are other times during the year (read: our orbit around the Sun) that we recognize Earth residing at a special place. There’s Perihelion (which we went over in January) and Aphelion, and then the widely-celebrated solstices; but I’ll save that for another time. This article originally posted on March 20, 2012. Tagged Earth, egg balancing, equinoctes, equinox, orbit, solstice, Sun.